Last November, at the Socialist Partys Socialism 2006 weekend the so-called International Bolshevik Tendency (BT) sponsored a fringe meeting entitled Why the Socialist Party is not socialist, featuring a former member of the Socialist Party, Michael Wainwright, as a speaker. The Socialist Party, led by Peter Taaffe, sometimes at least nominally appeals to socialism or the working class. However its antecedent, the Militant tendency, spent decades as an organic part of the old Labour Party. Today, despite its denunciation of New Labour as a bourgeois party, what the Socialist Party offers is merely Clause IV-style old Labourism. This programme was upheld by successive Labour governments in the past as they served the interests of democratic British imperialism, including sending British troops to Northern Ireland in 1969; introducing grotesque racist measures such as virginity tests for Asian women immigrating to Britain in the 1970s, and strikebreaking against the unions at home. The Taaffeites too have a record of lining up on the side of democratic imperialism and of refusing to call for the withdrawal of British troops from Northern Ireland. The BT offered some orthodox-sounding criticism of the Socialist Party but this was limited to the Taaffeites most blatant reformism on the state: the call for the commanding heights of the economy to be nationalised through an enabling act in parliament; for community control of the police and the claim that the police are workers in uniform. Wainwright also exposed the fact that the Public and Commercial Services union (PCS), whose leadership is dominated by Socialist Party members, includes immigration police. This is a scandal. The police are a core part of the capitalist state and are deadly enemies of the workers movement and the oppressed. We demand: Immigration police out of the PCS! We have decisively refuted the Taaffeites positions on the state in our 1994 pamphlet Militant Labours touching faith in the capitalist state, based on Lenins understanding that the state is an organ of class rule, an organ of the oppression of one class by another (State and Revolution, 1917) that cannot be reformed or pressured into acting on behalf of the working people and the oppressed, but has to be shattered by workers revolution. As our comrades pointed out, the BTs discovery that the Socialist Party is reformist is hardly a shocking revelation on the British left. Moreover the BT fully embraces the wretched politics that define the Socialist Party more broadly—pandering to backward consciousness, anti-communism and Labourism. Thus BT speakers in the meeting were silent about the Taaffeites blatant chauvinism regarding Northern Ireland, their support to counterrevolution in the USSR and Eastern Europe, and their gross capitulation to the racist war on terror. However, with the Taaffeites, what you see is what you get—old Labour reformism pure and simple. But with the BT, what you see is not what you get. The BT is led by one Bill Logan, a man we expelled in 1979 as a proven, massive liar and a sexual sociopath who manipulated the private lives of comrades for reasons of power politics and his own aberrant appetites and compulsions. In a party trial, Logan was found guilty of inhuman torture of one comrade whom he rendered suicidal in his attempt to force her to have an abortion and, failing that, to give up her baby for adoption. Knowing his history, the organisation that today calls itself the BT took up Logans case at its foundation and later declared him its leader. Over the years this outfit has engaged in all manner of lies, smears and provocations against us, which stands in stark contrast to its fawning over Labourite reformists. As our comrades argued in the BT meeting, the Socialist Partys record on the war on terror, the cutting edge of racist terror in this country, is rotten. The BT was silent on this, which stems from their own indifference to racist oppression. 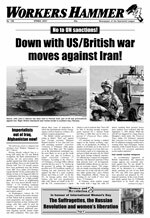 Following the criminal London Tube and bus bombings in July 2005, amid a wave of racist anti-Muslim hysteria over terrorism, the Taaffeite newspaper repeatedly ran a banner headline that said No to terrorism, no to war. This was a gross capitulation to those like Labour MP Alice Mahon and London mayor Ken Livingstone, who oppose the occupation of Iraq (out of concern for British imperialisms image abroad) but support the war on terror at home. The loathsome Livingstone pledged his backing for the police, after they killed Brazilian electrician Jean Charles de Menezes in cold blood. Spartacist speakers also exposed the BTs efforts to pose as opponents of community control of the police. The BT raised its very own version of community control of the cops in the US. Against the background of a multi-racial explosion in Los Angeles in 1992, when the racist cops who sadistically and repeatedly beat and tortured black motorist Rodney King were acquitted, the BT threw itself into a California outfit called Copwatch whose stated aim was to reduce police violence and harassment through accountability. While pretending to uphold the Marxist position on the state, the BT also argued that, depending on the political composition and effective powers given to it, establishing a civilian police review board with a real measure of independence from the cops is a demand which Marxists can support (Cops, Crime & Capitalism, 1917 West, October 1992). The notion that the police—the front line enforcers of capitalist state repression against workers and minorities—can be made accountable, is the essence of reformism. The call for civilian review boards or for police accountability is a standard ploy by reformists to foster illusions that the institutions of democracy can be used to curb the excesses of the police. During the Israeli invasion of Lebanon last year, the Taaffeite organisation in Israel published a leaflet that had not a single slogan addressing the defence of the Lebanese or the Palestinian peoples (see Israeli Taaffeites Capitulate to Zionism Over Lebanon, Workers Vanguard no 879, 27 October 2006). Yet the BT raises a howl about social chauvinism over Lebanon—not against the Taaffeites—but against the ICL. They lyingly accuse us of social patriotism, based on the fact that in 1983 we did not cheer as an act of anti-imperialism the deaths of 241 US Marines in Beirut blown up by a car bomb—planted by persons and forces unknown amid a squalid, multi-sided communal civil war. We conjuncturally raised the slogan Marines Out of Lebanon, Now, Alive! to intersect a moment of popular revulsion in the US against Reagans Lebanon adventure, coupled with  U.S. Out of Grenada, Dead or Alive! (Workers Vanguard no 341, 4 November 1983). Little does it matter to the BT that we used both slogans precisely to underline the fact that unlike in Lebanon, we did have a side in Grenada with the Cuban-allied nationalist regime against the imperialists. As we noted at the time, the ETs vicarious bloodthirstiness was directly proportional to their distance from where the blood was being shed. On numerous occasions our comrades have challenged BTers to get up in meetings of the Socialist Party and argue that British troops in Northern Ireland should live like pigs, die like pigs, as they said about Marines in Lebanon, but this outfit wouldnt dream of it. Its venom is reserved exclusively for the ICL. When it comes to conciliating national chauvinism, the Socialist Party and the BT are not fundamentally different. Taaffes organisation is particularly egregious on Northern Ireland—an acid test for socialists in Britain—having refused for decades to call for immediate withdrawal of British troops. It also has a history of making common cause with anti-Catholic Loyalist scum, such as in 1995 when the Taaffeite group in Northern Ireland invited Loyalist paramilitary leader Billy Hutchinson to its meetings. Today it campaigns for the democratic rights of the Orange Order to march—ie to stage anti-Catholic provocations. In a similar vein the BTs flagship group in Canada—where the oppression of Quebec is a dividing line between national chauvinism and revolutionary internationalism—has a profile as apologists for Maple Leaf Anglo chauvinism, opposing the call for independence for Quebec. This organisation has the dubious distinction of being the socialists officially invited to a Montreal Canadian unity rally on the eve of a 1995 referendum on Quebec sovereignty. As we noted: Its no accident the BT was invited to this we love Canada rally organised by top business leaders—because the BTs leaflet on the referendum (issued only in English!) also called on Quebec workers to vote No to independence (Kneeling Before the Body of General Wolfe on the Plains of Abraham, Workers Vanguard no 827, 28 May 2004). Here is an International Bolshevik Tendency that opposes our call for an independent, socialist Kurdistan and sneers at virtually every other struggle against national and racial oppression. The BTs group in New Zealand, a white imperialist enclave whose history is marked by xenophobia and brutal repression of the Maoris, has written barely a word about the oppression of the Maoris. Yet in 2003 this selfsame BT fabricated an allegation of vulgar chauvinism against us, and then circulated the slander at the Socialist Workers Partys (SWP) annual Marxism event in London to further incite the SWP goons and censors against our comrades. As the BT knew full well, a few months prior to Marxism SWP honcho Chris Bambery had publicly threatened our comrades for our principled opposition to the class-collaborationist Stop the War Coalition, fulminating that anyone who doesnt politically support it deserves a bullet in the head. (See Bill Logan: From Krafft-Ebing to Mother Theresa? BT: Renegades for Hire, Workers Vanguard no 807, 1 August 2003). The BT has a rather consistent history of staging provocations against us just when other forces—ranging from the reformists straight up to agencies of the bourgeoisie—are gunning for us. Thus in 1983, the ET (as it was then known) launched an international campaign labelling us as violent, lying that we had assaulted one of their members. We were at the time engaged in a very serious legal fight against the FBI, which had targeted our organisation as violent. And here we had a group formed by ex-members of our party screaming that we are violent. Whose interests did this serve? A classic example of how the BT slander of us as a cult serves the interests of larger forces that are the enemies of the working class and oppressed can be seen in the campaign to free American black political prisoner Mumia Abu-Jamal. In 1995, the Wall Street Journal, mouthpiece for the American capitalist rulers, tried to undercut the growing international protest in defence of Jamal who was then under immediate threat of execution. In their efforts to portray Jamal as a depraved cop killer, they used the BT as an authority to smear the Partisan Defense Committee—the central organisation that had been fighting for others to take up his case—as associated with a crazed cult. Quoting the BTs slanderous piece, The Road to Jimstown (Bulletin of the External Tendency of the iSt, May 1985) the Wall Street Journal (16 June 1995) wrote: The Spartacists are led by a man named James Robertson, prompting the International Bolshevik Tendency, a group of former Spartacists, to deride their old party as Jimstown, a takeoff on Jonestown in Guyana, the jungle site of mass suicide. The Wall Street Journal certainly got the point of the BTs lurid smear of our party as an obedience cult and its allusion to the notorious 1978 mass suicide by an evangelical religious cult. Two years before the Journal article appeared, charges of cultism had been used to justify the Clinton administrations murderous assault on the Branch Davidian compound near Waco, Texas, resulting in the incineration of some 100 men, women and children. As we have often said, the intent of the Wall Street Journal was clear enough; how and why the BT was so easily used as a tool by them is not. Supplying the Wall Street Journal with ammunition was not the BTs only service to those who would like to see Mumia Abu-Jamal dead. Today the BT postures as defenders of Mumia, who is a former Black Panther and supporter of the MOVE organisation. In May 1985, the Philadelphia police in collusion with the FBI dropped a bomb on the radical back-to-nature MOVE commune, murdering eleven black people (five of them children) and incinerating a whole neighbourhood. The New York Spartacist League sponsored a memorial meeting for the bombing victims, inviting MOVE supporters to attend and speak. In the very first issue of its new periodical 1917 (Winter 1986), the BT grotesquely complained about the convivial atmosphere at the meeting because we did not politically attack MOVE and SL speakers confined their remarks to denouncing the authors of the hideous massacre . The BT, on the contrary, saw the occasion as the time to denounce a spokesman for the governments victims and to go after the SL for not turning the memorial meeting into a political free-for-all against MOVE! The BTs hostile obsession with us is intertwined with their social-democratic anti-communism. They hated our Trotskyist defence of the Soviet Union when it existed and today reject our stand for unconditional military defence of China and the other remaining deformed workers states—Cuba, North Korea and Vietnam—against imperialist attack and counterrevolution. At the same time we fight for a proletarian political revolution to sweep away the Stalinist bureaucracy and replace it with a government based on workers and peasants councils. The claim that Taiwan suffers national oppression (which is laughable coming from Taaffe, whose organisation prides itself on not opposing British oppression in Ireland) is bogus: what divides it from China is the class character of the respective states. Taiwan has since ancient times been part of China; since 1949 it has been a staging post and a pretext for counterrevolutionary manoeuvres against China. Like Taaffe, the BT—which opposes the struggle for national independence virtually everywhere on the planet—professes a touching concern for national oppression in Tibet. This is nothing but a cover for the BTs embrace of counterrevolutionary forces against the Chinese deformed workers state. According to the BTs 1917 (2004): By agreeing that the Tibetans or Uighur have the right to control their own domestic affairs, a revolutionary government in China would signal its willingness to coexist with Tibets traditional ruling caste and Xinjiangs mullahs as long as they retain popular support. The BTs conception of a revolutionary workers state is one that should co-exist with an independent or autonomous Tibet run by imperialist-backed counterrevolutionary forces, including the CIAs favoured god-king, the Dalai Lama. The BTs support for counterrevolutionary forces in China confirms what we have always said—that its founders couldnt stomach our Trotskyist defence of the Soviet Union in the early 1980s. Their depiction of our organisation as a Stalin-style gulag and personality cult, a central tenet of their existence, goes hand-in-hand with this anti-communism. This outfit hated our slogan Hail Red Army in Afghanistan! which expressed our unconditional military defence of the USSR and our recognition that, whatever the intentions of the Stalinist bureaucracy, this military action posed the possibility of extending the social gains of the Russian Revolution to the peoples of Afghanistan, especially its brutally oppressed women. In August 1991, Boris Yeltsin seized on the coup attempt by Gorbachevs former lieutenants to launch a power bid, acting as the local representative of the US imperialists. Again the ICL stood out prominently. We were unique in our efforts to mobilise Soviet workers, mass distributing our leaflet headlined Soviet Workers: Defeat Yeltsin-Bush Counterrevolution! throughout the Soviet Union. While we recognised that the state power had been decisively fractured by Yeltsins countercoup in August, we attempted to spark working-class action against the counterrevolutionary forces and for proletarian political revolution in defence of collectivised property forms. Only when it was clear over the course of the next year that the working class was not going to move against Yeltsin, who was rapidly consolidating a capitalist state apparatus, did we conclude that the Soviet workers state had been definitively destroyed. The BT cynically called for a military bloc with the pathetic coup plotters—although there was no military engagement and not a single shot was fired—only to unburden themselves of any nominal claim to being Soviet defensists, proclaiming that the Soviet degenerated workers state had been destroyed the moment Yeltsin defeated the coup plotters. Thus they gladly wrote off in advance (from a distance) any possibility of working-class resistance, which could have swept away Yeltsin and his forces and opened the road to proletarian political revolution against the Stalinist bureaucracy who were selling the Soviet Union to the capitalists. The BTs positions are fully imbued with the anti-communist stereotype that Stalinist totalitarianism has reduced the working class in the deformed workers states to mindless automatons. This is at the root of their insistence that there was no possibility of a revolutionary outcome in East Germany in 1989-90. This is combined with bitter hostility to the one organisation that fought to realise this—the ICL. Having accepted the triumph of capitalist counterrevolution in advance, the BT sneered in an article headlined Robertsonites in Wonderland that we had invented an imaginary political revolution (1917, Third Quarter 1991). There was nothing imaginary about the fact that hundreds of thousands of workers took to the streets of East Germany to demand an egalitarian socialist society. The BT was contemptuous of the fact that we mobilised our resources internationally in the effort to provide Trotskyist leadership to that incipient political revolution, fighting for a red Germany of workers councils. We initiated the 250,000-strong united-front protest in East Berlins Treptow Park on 3 January 1990, which was taken up by the ruling Stalinist party, that was called to protest the fascist desecration of a memorial to Soviet soldiers who died liberating Germany from Hitlers Nazis. The BT spits on this pro-Soviet rally, which was premised on defence of the workers states, complaining that we did not offer a platform to the anti-Soviet, pro-capitalist West German Social Democratic party (SPD). In denouncing our Treptow demonstration the BT is taking a stand against the defence of the DDR and the Soviet Union; against the incipient political revolution and for the SPD, the Trojan horse for counterrevolution in East Germany. Following his expulsion from our organisation, Bill Logan resurfaced in his native New Zealand as leader of the Permanent Revolution Group (PRG), an outfit that has much in common with the Taaffeites when it comes to Labourism. In 1989-90 Logans PRG liquidated into the New Labour Party when it was founded by Jim Anderton as a split from the Labour Party. In the context of an extremely right-wing Labour government, Andertons party was founded in the real spirit of the original Labour Party. To say he represented no political break from Labourite politics is something of an understatement—by 1999 he was deputy prime minister; he supported the government on the bombing of Afghanistan and now leads the Progressive Party, which is not even a working-class formation. Inside Andertons New Labour Party, the PRG formed a loyal opposition. (See Strange things under Wellingtons rocks, Australasian Spartacist no 155, Summer 1995-96). The PRG boasted that: We were quite open that we supported the New Labour Party and wanted to build it and added that: We made it clear that we saw this attempt at establishing a democratic workers party open to all tendencies—including revolutionaries—as a good thing (Against Centrism/An Exchange of Documents between the Permanent Revolution Group and the Communist Left, 1991). Following its expulsion a year later, the PRG swore its continuing fealty to New Labours principles and objectives and rhapsodised about its potential to be a voice of ordinary working people, of the oppressed and disadvantaged (PRG leaflet, Violence, Democracy & Jim Anderton MP , 26 April 1990). Such rapturous praise for a democratic workers party open to all tendencies, which Logan considers to be a good thing, reeks of the Labourite ideal of a mass reformist party that acts as a broad church, meaning it should tolerate fake leftists within it. Far from being a voice of the oppressed and disadvantaged, such parties are inevitably social-chauvinist, reflecting the prejudices of their own ruling class. Not long after setting up a group in London, Logans organisation politically liquidated into Arthur Scargills Socialist Labour Party (SLP) in early 1996. While the SLP was based on old Labour reformism, it did represent a partial break from New Labour and—unlike most of the socialist organisations in Britain, including the Taaffeites—it drew a line by refusing to call for votes to Blairs New Labour. For that reason, we extended critical support to SLP candidates on a number of occasions, while at the same time clearly counterposing our Leninist-Trotskyist programme to the SLPs reformism. Inside the SLP, the BT opposed Scargill from the right, arguing in favour of supporting the Socialist Party in the 1997 election. The Socialist Partys campaign was totally subordinate to voting Labour (or anyone) to get the Tories out. We have documented the BTs record as a walking provocation against the ICL and exposed the manipulative sociopath, Bill Logan, it embraces as its leader (see BT: Renegades for Hire, Workers Vanguard no 807, 1 August 2003 and BT: A Walking Provocation, Workers Vanguard no 808, 29 August 2003). We do this not simply for the purpose of elementary political sanitation, but because a new generation of leftists must be made aware that the likes of Logan have no place in the workers movement. We took the unusual step of publicly releasing our three internal bulletins On the Logan Regime after we expelled him from our international organisation (then the international Spartacist tendency) in 1979. The Spartacist League of Australia and New Zealand Central Committee charged Logan with systematic and conscious violations of communist morality during his tenure as national chairman of the SLANZ between the years of 1972 and 1977 and with repeated, conscious intervention into comrades personal lives as part of a pattern of calculated personal and sexual manipulation, passing off intimate managing of comrades personal lives as a legitimate and central function of the national chairman (see On the Logan Regime Part III, International Information Bulletin no 16, November 1983). to those who prepared it and those who served it. That this man is the anointed leader of a putatively Marxist organisation should tell you just about all you need to know about the BT.